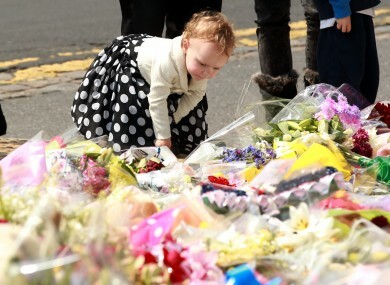 Two year old Ruby Kent from Hampton Court lays flowers outside the Royal Artillery Barracks, in Woolwich, east London close to the scene where Drummer Lee Rigby was murdered. POLICE IN LONDON have charged a second man with the murder of British soldier Lee Rigby. Michael Adebolajo, 28, is due to appear at Westminster Magistrates’ Court tomorrow. He also faces charges of attempted murder of two police officers and possession of a firearm with intent. Scotland Yard was waiting for him to be discharged from hospital before bringing charges. The victim, a 25-year-old father of one and drummer in the British army, was hacked to death in an attack on 22 May near his barracks in Woolwich. A second suspect, 22-year-old Michael Adebowale, has already appeared in court, also charged with the murder. Both Adebolajo and Adebowale were shot by police on the scene of the crime and spent nine and six days in hospital respectively. So far, police investigating the brutal crime have arrested 12 people. Eight have been bailed and two released without charge. Tensions in London have grown in recent days as far-right and anti-fascist groups hold demonstrations. The Rigby family has called for calm, issuing a statement asking that the soldier’s death not be used as a reason for reprisal attacks. Email “Second man charged with murder of Lee Rigby”. Feedback on “Second man charged with murder of Lee Rigby”.